The woods and a character called Wolf. Well, you’re into the land of fairy-tales, aren’t you. And in this instance, grim ones, as if there are any others! Robert Alan Evans it turns out was Rob Evans in another life. That’s to say, in 2004, his A Girl in a Car with a Man ran at the Royal Court Upstairs with a certain Andrew Scott playing a narcissist with a predilection for camcorder selfies alongside surveillance cameras catching a child abduction. What, asked Evans then with some prescience, is all this surveillance and blasted images doing to our minds? The role of the questionable Alex earned Scott his first acting award. Fourteen years on, and after Evans subsequently moved into plays for young people, his dark lens is now pointed at motherhood. Or rather mothering. Or rather, the effects of post natal depression on being a mother. Perhaps somewhere in there, Evans is questioning whether being a mother really doesn’t come naturally to every woman. But framed within his very strange fantasy/surreal setting, this possibility only comes into hazy focus towards the end of an eighty five minutes that seemed all too extended in Lucy Morrison’s omen-filled production. There are signs to be sure. 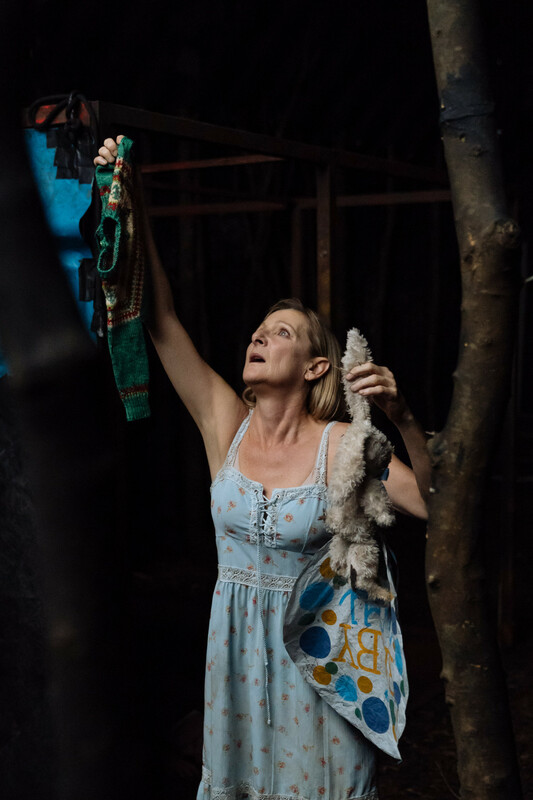 Naomi Dawson designs a lofty domestic kitchen above a tangle of trunk and branches below which Lesley Sharp’s `Woman’ is sheltering in a run-down shack. (Later, the objects we see in that `normal’ kitchen, a baby monitor, birthday balloon and a child’s cardigan, will turn up buried in the ground). Beside the woman is a quivering boy, an object of her protective desperation. She wants to protect him at all costs. She found him frozen in snow. She called his name – `Mathew’. Now they are bonded. Meanwhile a smart-looking Wolf in clean yellow tracksuit and white calf shoes looks on and from time to time, makes assaults upon the pair. Metaphors as myth are all very well. But there has to be some tangible way by which we enter into the reality of that metaphor. I get the sense, after reading Evans’ script, that it is loaded with codes. Nothing quite stands for what it is, what we experience in `present time’ in the play. Lesley Sharp’s `Woman’, for example, carries a Southern states American accent which gradually morphs into an English one. 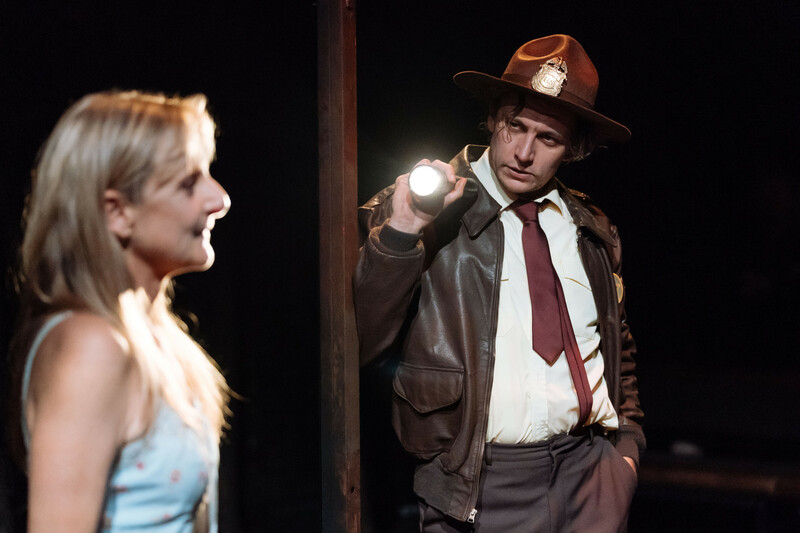 Tom Mothersdale’s Wolf meanwhile becomes dirtier, grungier and by turns, adopts the characters of a highway cop, a store-keeper in an `area of outstanding natural beauty’ and cig-smoking trans-dressed mum, but always as Wolf, attempting to wrench the Boy away from Sharp’s `Woman’. There are several ways of looking at all of this and eventually, I settle for the idea that all of the aforementioned actually passes for a metaphorical expression of Depression as a hideous wolf in sheep’s clothing (to coin a phrase from Wolf himself), of the wood being an image of the darkness which penetrates every fibre of the mother’s being until finally the fear and the dread so overtakes her that paradoxically, the protective instinct for her new-born baby actually forces her to kill it, to save it from the pain and darkness she is experiencing. Sharp turns in a harrowingly subtle performance as the infanticidal mother, her face alive with anguish as the fictitious American – a symbol of how alien she feels from herself – before adopting a much cooler persona in her own voice. Tom Mothersdale is athletically, nonchalantly, menacing in his various shapes and forms and although Finn Bennett, making his stage debut, spends most of his time huddled, speechless, on the floor, his impact is nonetheless poignant. In form and indeed in subject matter, Evans deserves praise for the risks he takes dealing with such with emotive issues as infanticide, depression and motherhood. Yet whilst admiring all of this, I just wish I could have felt more engaged in The Woods and by it. You enter dark places when you enter the Royal Court and sometimes that can be enthralling and exhilarating. But there needs to be some kind of uplift. Sadly this time, it wasn’t present. 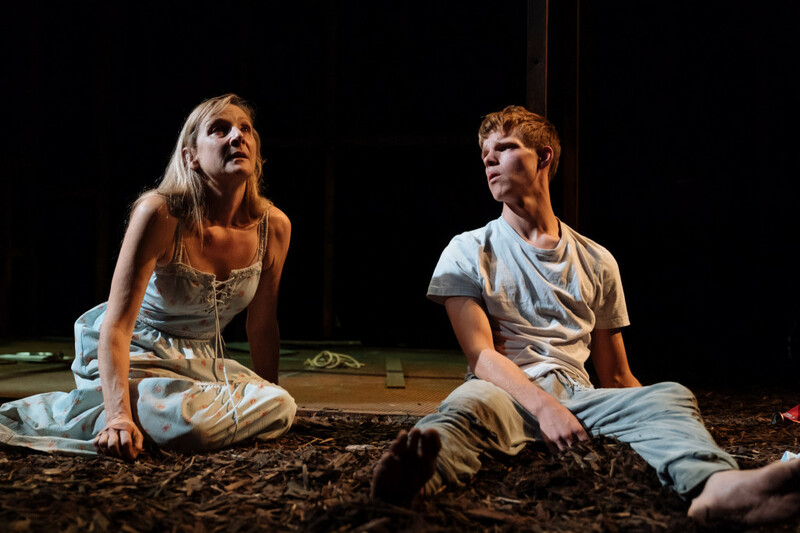 This entry was posted in 2018, Reviews and tagged A First World Problem, Finn Bennett, grim fairy tales, infanticide, Lesley Sharp, Lucy Morrison, Robert Alan Evans, Royal Court Jerwood Theatre Upstairs, Tom Mothersdale, Woods as metaphor for depression on September 23, 2018 by Carole Woddis.